The people of Haifa, masters of resilience like all Israelis, carry on with their lives. 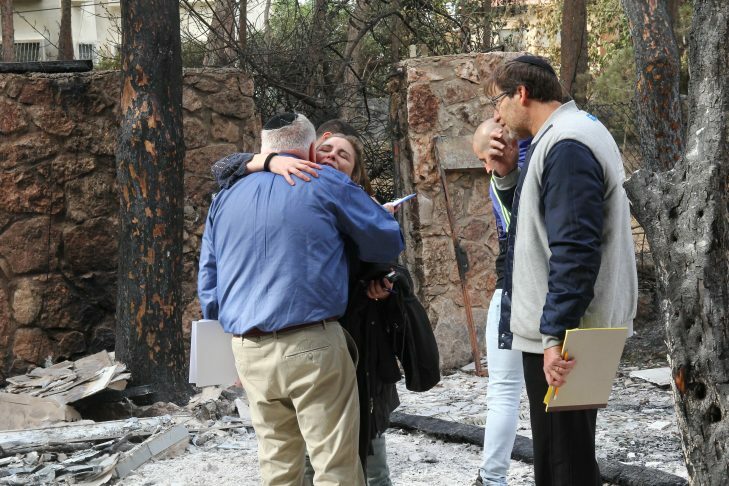 Barry Shrage, left, visits with Israelis impacted by the fires in Haifa. I arrived in Haifa yesterday evening, coming directly from Ben Gurion Airport to meet our Boston-Haifa committee members in the Romema section of Haifa. The smell of smoke and ashes seems to be everywhere. This neighborhood, on the northern slopes of Mount Carmel, was particularly hard-hit, but the city, as always, looks beautiful to me. The people of Haifa, masters of resilience like all Israelis, carry on with their lives. The people I met with, part of the leadership of the Boston-Haifa Connection, had spent much of the day leading rescue and recovery efforts in the city. Most of them had been evacuated from the city just a few days earlier, and one had seen his house burned to the ground. Despite the obvious exhaustion and strain, the group was optimistic. Among the group was Dadi, the chair of Mati Haifa, the small business-development center founded and funded in part by CJP and Eran, the project’s dynamic new executive director. Together with their team, they have been developing a plan to provide loans to small- and medium-sized businesses damaged by the fire using funds provided by CJP. These funding efforts were crucial in helping Haifa recover from wars and fires, including the devastating 2010 Carmel fire. Dadi owns a beautiful restaurant, which happens to be next door to a gas station. Both the gas station and the restaurant were directly in the path of the spreading fire. It was impossible to detect that the calm and hospitable restaurateur sitting at our table had been up for days with hundreds of firefighters and volunteers defending his restaurant and the gas station that would have destroyed a dozen square blocks if it had caught fire. 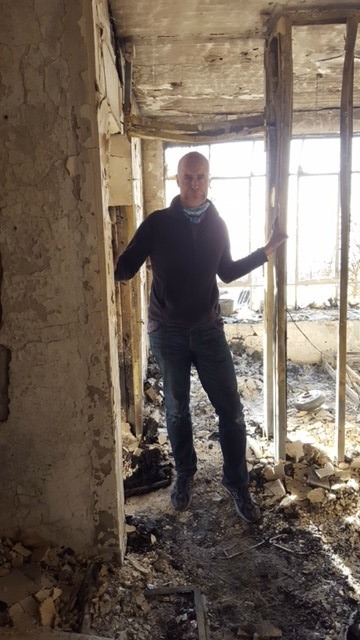 Eran’s house, which he had only recently renovated, was completely burned to the ground. Yet there they were, sitting around a table dreaming of a city restored. Haifa is a city filled with determined people who will rebuild and improve what the flames destroyed. The fire damaged 2,000 homes and left 2,600 homeless, but it didn’t destroy the spirit of the city. The air remains smoky, but the vision of the people is clear. This story and video from The Times of Israel beautifully captures the spirit of Haifa, a city that is proud to be a model of co-existence…not perfect, but striving to be, and with deep faith in its people. Over the next few days I’ll be talking to the leaders of the city and its people to see how we can help.